Abstract: The 12-bit encoding engine boasts 2D 5-line comb filtering and a 3D comb filter. The 3D comb filter reduces artifacting and colour bleeding in the final image. TV-tuner cards have been with us for a while, but with the recent surge of digital video recording products and digital Television, they've taken a step back in terms of importance. While five or six years ago it might have seemed clearly desirable to connect your cable signal to your computer and have all your media controlled and recorded in one handy location, the technologies have diverged since, and TV-tuner technology has been on the back burner. Computer power has been progressing in leaps and bounds though, so it may well be time to revisit the whole 'computer as media centre' phenomenon and see what has been gained. 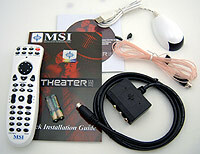 As you probably know, MSI makes a wide range of computer products, including many videocards powered by ATI chipsets, so making a TV-tuner based on the Theatre 550 Pro chipset does not seem like much of a stretch for the company. System requirements are a Pentium II (or AMD equivalent) or later with 128MB of memory and 1GB of free drive space. In our experience with the chipset, a 1GHz processor with 256MB of memory and several gigabytes of hard drive space to spare should be considered the minimum to get the best out of the chipset. 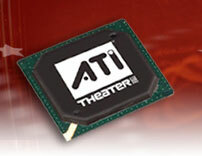 ATI's newest TV-tuning and video capture chip boasts several interesting features. The 12-bit encoding engine boasts 2D 5-line comb filtering and a 3D comb filter. The 3D comb filter reduces artifacting and colour bleeding in the final image. A noise-reduction engine is also built into the chip to reduce visual static from the original video signal. MPEG 2 video and audio encoding is integrated into the chip, taking the load off your system's processor. As we've just said, the ATI Theatre 550 Pro chip is also a digital audio processor, and it receives the audio stream at the same time as the video stream. The audio is digitized with the 12-bit analog to digital converter before being sent for MPEG encoding. This is definitely a new wrinkle, as previous ATI TV-tuning chips did not process audio at all, and it was done by other components. Hopefully this ability will enable the 550 Pro to better synchronize sound and video components. 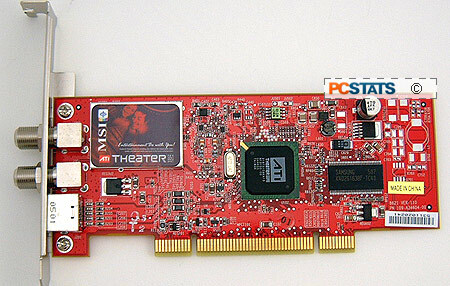 The ATI Theatre 550 Pro chip supports both standard PCI and PCI Express x1 form factors, and cards based on this chip might be one of the first non-3D card consumer peripherals we see for the new PCI Express bus. The MSI model we tested here is for PCI slots only. The Theatre 550 Pro chipset is comprised of the 550 Pro chip combined with the ATI T1 TV and FM radio tuner. Interestingly, ATI claims that "frames will never be dropped" during video representation. The other tuner we tested based on this chipset had extremely high system requirements, something that the MSI version does not share. This is interesting since we would assume that making sure the 550 Pro is running in a system with enough horsepower to keep up with it is the only way that ATI could afford to make a statement like this. Like most mainstream TV-tuner chipsets, the Theatre 550 Pro does not handle high-definition TV, nor can it decode or change channels on digital cable or satellite signals without additional components. This means that owners of HD TVs need not apply, and owners should be prepared to use their own remotes to change channels on digital or satellite boxes, as the tuner card cannot do this by itself.